When should a child start learning the alphabet? Well, most children can begin recognizing letters between ages 2 and 3 years old and can identify most letters between ages 4 and 5. So you can get an early start at age 2, according to babycenter.com. But flashcards won’t work for a toddler. They are visual learners. 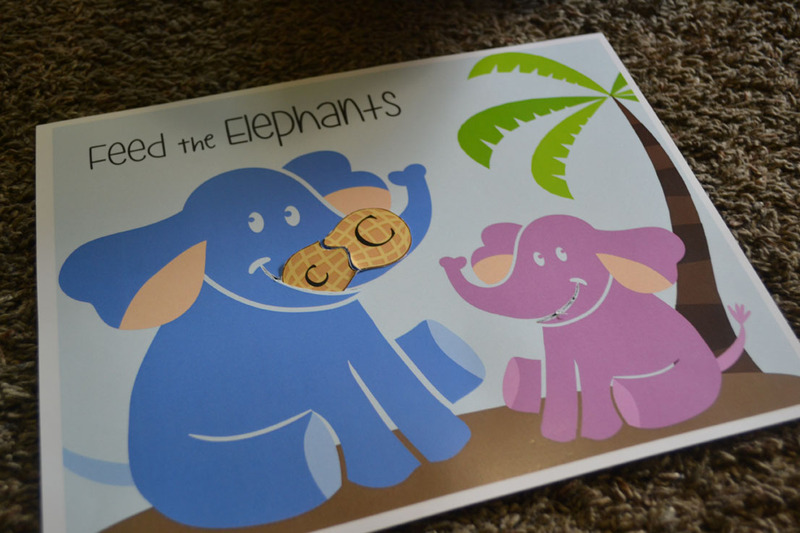 That’s why this Feed the elephant – FREE printable is perfect. It is cute, fun, easy and inexpensive. (This idea came from JennyPhillips.com preschool curriculum. It used fewer letters and my child loved it so much that it inspired this printable for kids to enjoy!) Plus it’s easy to store and pull out whenever you want your kids to practice. So follow these three simple steps to creating your own ABC printable. I sent my printable to Alphagraphics and they printed it for $2. Make sure you have them print the pages on cardstock so they are more durable. I then cut out each individual peanut and then cut along the squiggly line in the middle. Making puzzle pieces out of each peanut allows your child to identify lower case and upper case letters from an early age. I also included some number and color peanuts for fun. Now take a razor blade or sharp knife and carefully cut a slit along the mouth of the mommy and baby elephants. Make sure they are big enough to fit the peanuts through. Then I just took a sandwich bag and cut one half of it off. The other half I attached to the back of the printable with duct tape. That way the peanuts have somewhere to collect while you’re feeding the elephants peanuts. Another option is using a plastic sheet protector. Carefully cut a slit through the TOP layer of the sheet protector and the paper ONLY! Don’t go through the back layer! Wrap some tape into each elephants mouth to hold the top layer and paper together, making the paper stay and have the slit easily accessible. You can keep in a 3 ring binder for storage. #3 Try out the ABC fun! My kids jumped right into this activity without any instruction at all. For older kids, it’s easier for them to put together the upper and lower case letters. But, you might need to help the younger ones. It’s fun just to ask your kids the names of the letters as they put them into the elephant’s mouth. Or you can ask them to find specific letters. This is a great game to play with your kids because it involves matching and learning their letters in a fun way. The more repetition the better, so try pulling this printable out as often as possible. Before you know it, your kids will know the alphabet forwards and backwards. So, here’s the link to the Feed the elephant – FREE printable, one more time. I hope you have fun with it as much as my kids did! You can also try making these awesome DIY Build a word blocks that help kids with all learning types. Another great item to try are these Wipe Clean Letters Learning Books. 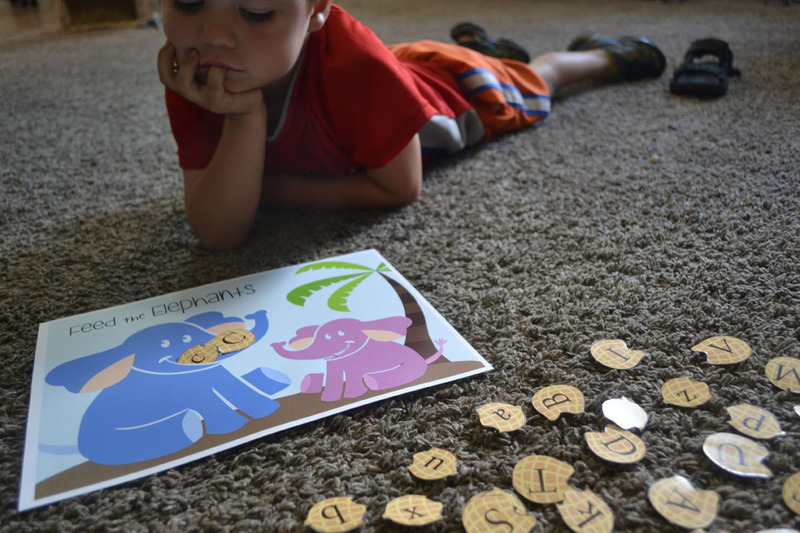 What other kinds of letter games do you like to play with your kids? Leave your comments below.